Sister to COPENHAGEN (lost in 1917) and ST. PETERSBURG (later ARCHANGEL). 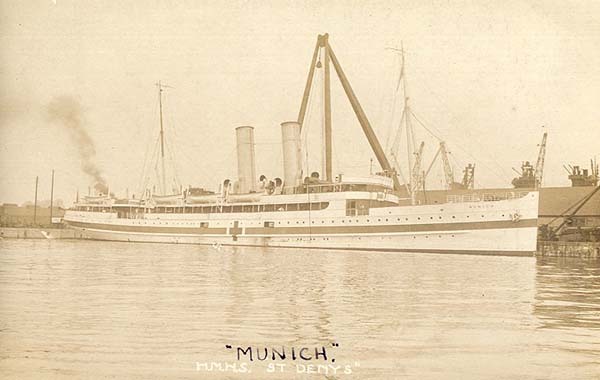 Served as a hospital ship from 1914 to 1919. Renamed ST. DENIS in 1915. Sent to Rotterdam to pick up British civilians in May 1940, she was scuttled and abandoned after bombing damage as the German forces advanced, her crew being rescued by fleet-mate MALINES. She was refloated and renamed BARBARA as an intended conversion to a minelayer, but due to damaged machinery she was used only for accommodation as ‘Schiff 52’ at Cuxhaven and Kiel. This role continued under Allied forces at Kiel from 1945 until 1949, housing refugees and students of Kiel University. Towed back to Sunderland for scrapping, where she arrived 2 March 1950.